The City of Aspen has released a RFP proposal for Cozy Point Ranch on-line. They are looking for individuals or groups to come forward with intent to lease Cozy Point Ranch. This process could tie up the ranch for ten years. The RFVHC will respond on behalf of our membership in the future. We are asking members to reach out to us immediately with questions, interests and concerns. We are looking for interested parties. The time-lines are tight. The on-line contact is listed below if you are interested in learning more about the process. The City of Aspen states: The purpose of this Request for Proposals (RFP) is to solicit professional, agricultural, educational, and/or equestrian operation lease holder(s) for the City of Aspen owned Cozy Point Ranch Open Space (CPR). Cozy Point Ranch is a unique open space property, where the fabric of our community can be shared and celebrated, from our agricultural heritage to concepts of the Aspen Idea. It is hoped that every child, who grows up in our community and all those who visit Aspen will develop a special connection to Cozy Point Ranch, where their lives will be enriched by formative experiences. Here is a snapshot from the RFP process --contact us for more details. For an in depth historical account of the property refer to the CPR Management Plan. City of Aspen Parks and Recreation Department: Aspen's recreational facilities include over 30 world-class parks ranging from small neighborhood parks with playgrounds to over 1,300 acres of vast open spaces with mountain vistas and streams. Serviced by 22 miles of pedestrian/bicycle trails and over 90 kilometers of cross country/Nordic trails. Aspen parks and athletic fields create spaces for picnics, quiet contemplation, weddings, soccer and rugby games, and our downtown pedestrian mall provides premier international people-watching where children can play in the DeWolff/Fulton fountain. Proposals will be reviewed and selected by Cozy Point RFP Evaluation Committee selected by the City of Aspen Parks Department. All submissions must follow submission requirements (Chapter 4.0 of this document) for selection consideration. Once selected the review board will present this selection to the City Council for approval. Pitkin OST Board meeting Regarding the Cozy Point Management Plan approval on Jan 19th, 5:00 pm, Aspen City Hall downstairs. Please come to listen and comment. Click link here to see the new Management Plan. Finally, we have RFVHC Board consensus for presenting our Management Plan Response Document. Our intention was to get this done earlier but the time for analysis was longer than we anticipated. We are proud of the information presented, and we hope that you will review our efforts and take this document as a true attempt at honest helpful criticism to make Cozy Point Ranch better for everyone. Our belief is that planning for future expansion and growth must be considered for the sake of both Cozy Point Equestrian and Aspen TREE. Please accept this RFVHC report with our kindhearted intention to help bring Cozy Point Ranch up to the standards befitting a City of Aspen Open Space property. Use this link to access the document. The Link, is a download service called BOX, it is excellent and transfers large files, such as this easily. Download it onto your computers, and then print if you want a hard copy. It’s 50 pages but quite large font, so it’s easy to read with only 5-6 pages of color photos.Copy and paste this link and send to any interested horse owners or CPR stakeholders. Please join RFVHC today and stay involved in the process. Now, by understanding the facts presented, the discussion on Cozy Point Ranch is closer for decision making by the City of Aspen regarding the future of this prominent Open Space property at the gateway entrance to Aspen and Snowmass Village. The RFVHC has written a Compilation Summary for the City of Aspen's proposed Management Plan. We have taken the Plan and indexed the subjects into short understandable issues, giving the RFVHC position on each issue, including the big picture for the ranch. In making the Compilation we read all of the letters the City received over the years, all of the documents made available to us in public records, and a Survey Monkey of 35 questions we hosted regarding CPR. We ask for your opinions so that the citizens and supporters of Cozy Point Equestrian can be involved in the best possible outcome. UPDATE : This is an important part of the process that we are hopeful will gain your attention - bring any questions and concerns and support for the ranch to the meeting. These are the steps in the process that take all of us closer to making Cozy Point Equestrian better and better! Get involved and stay involved ! Please come and support making Cozy Point Equestrian the best for our community! The Cozy Point Management Plan has been a long two-year process. The Roaring Fork Valley Horse Council is happy to be involved and to speak directly to you at this time about the future of the long-term equestrian operations of Cozy Point Ranch. The following items are missing from the current management plan, and we would like them to be included in the plan and incorporated into the new leases. A Cozy Point Ranch Oversight Committee. It is important that the oversight committee be filled with individuals, who have no conflict of interest. A Veterinarian – recommended from CSU – must be from outside the area. A Roaring Fork Valley Horse Council Board Representative. An Equestrian Architect – specializing in design and function. Due to the immediate infrastructure capital improvement needs, we recommend the Cozy Point Ranch Oversight Committee meet often, perhaps once a month initially, then quarterly, and then semi annually. One of the duties of this committee would be to implement a process for a review of annual performance, and establish a functioning method to handle complaints and incidents, so that resolutions can be remedied. The Cozy Point Ranch Oversight Committee will work together with all participating users at Cozy Point Ranch for the best outcome of the ranch for people, the livestock, the wildlife, and the land. Oversight members may visit the ranch and make notes for their oversight, then have coordinated meetings, phone conferences, supported by email communications. In this manner oversight may be guaranteed. Capital Improvements, which are recognized as an important element of the long–term viability of the lease premises shall be accomplished through the City of Aspen Asset Management Plan Process. This comes from Exhibit A, Long Term Stewardship lease Agreement for the Cozy Point Ranch and Equestrian Center page 4, # B. – Capitol Improvements. We ask that the Capitol Asset Plan, the Budget, and the Timeline for construction and completion be more clearly identified. The proposed capital improvements, which are identified in the Cozy Point Management Plan, must be confirmed with the Budget and Timeline, and an ongoing maintenance schedule for Cozy Point Ranch needs to be established. The RFVHC ask that the City Parks Department meet with the Equine Specialists from CSU, before capital improvements are budgeted for and implemented. The Veterinarian, the Equine Facility Specialist, and the Horse Management Specialist from CSU will give invaluable information for infrastructure improvements. This needs to happen immediately to keep to the suggested timeline of improvements, and to be fiscally responsible, and produce the best management practices. · The CSU Equine Experts should confirm acreage needed for horse turn out in paddocks and fields for stall horses. · The improvement for the drainage, the footing, and the fencing for outdoor paddocks will need to be coordinated at the same time, and the horses removed from this area while this occurs. Again, the amount of acreage, need by horses for turn out, should be qualified by these experts. · Currently there are trapped orders of mold, mildew, urine, bacteria and dust in the barn and arena. Proper daily, weekly, and monthly housekeeping would prevent these conditions from contaminating the environment. Insulation and ventilation of the barn and arena are mutually exclusive. Once the odors have been properly mitigated, then proper ventilation and insulation will help to maintain a healthy barn. The RFVHC asks that RFP process must be open and fair, well publicized with clear parameters, and with real opportunity for new leaseholders. The original lease, named the Cozy Point Ranch and Equestrian Center, described the premises as consisting of 93.5 acres. The interim lease describes the premises as 32.5 acres, thereby reducing the acreage by 2/3. We want clarification that a new RFP lease bidder has the right to expand the acreage of the lease beyond the 32.5 acres without prejudice. The RFVHC asks that the any new lease be for a 5 years period. Five years allows financial stability for a business, but offers more flexibility for change. Public admittance to Cozy Point Ranch is critical for our community to access the only public equestrian center in the Roaring Fork Valley. Safe public parking must be available for truck and trailer equestrian access. The Horse Council and the equestrian community advocates for a trail leading from the Cozy Point Ranch Equestrian Center (public parking area) through the fields, across Brush Creek Road, to the Pitkin County owned Cozy Point South, and Sky Mountain trails. We ask for an immediate timeline for this project within this year. We realize that the Brush Creek Road Crossing may take some time to resolve, but we would like to start the process now. The Horse Council has an idea for a safe, an affordable road crossing option. The RFVHC is ready and able to assist with the truck and trailer parking, the trail, and the crossing to Sky Mountain Park. The Roaring Fork Valley Horse Council respectfully asks that these items be addendums to this final Cozy Point Ranch Management Plan. We have great hopes and expectations for this wonderful, City owned, public, Open Space property. Feb 16th, 2017 5:00pm - Aspen City Hall, down stairs in the Sister Cities Room. 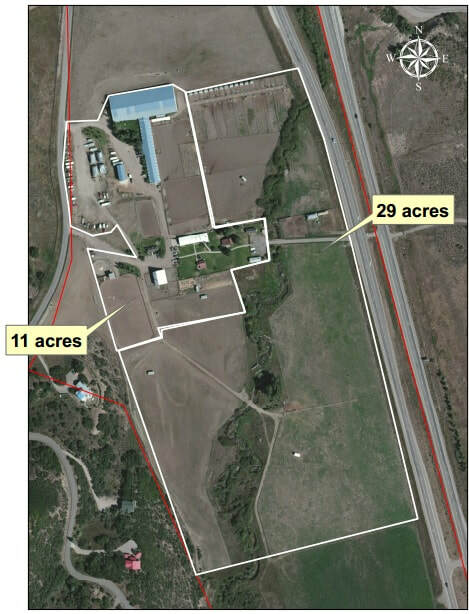 The new amended and proposed final Cozy Point Ranch Management Plan has reduced the Equestrian Center acreage by 2/3, from 93.5 acres to 32.5 acres. The RFVHC is alarmed by the consequences of this action. With less acreage the Equestrian Center will not be financially viable as it is today, without significant changes to it’s operation. Affordable amenities such the lesson riding programs, kid’s camps, inexpensive boarding, and public access for trails and arena use, will be difficult to sustain, unless under-written by the City Aspen. The reduced acreage will force an RFP approved responsible lease-holder to cater, over time to a minimum number of clients. If you reduce the acres, you then reduce the number of horses, which reduces the funds available to support the affordable amenities mentioned above. In addition to the horses that board year round, and seasonally, there is a seasonal herd of fifteen to twenty horses that comes in every summer, for the affordable camps and riding programs. The reduction of acreage will cause the ranch property to become further degraded, if the acreage is reduced as the Cozy Point Management Plan stipulates. The point of the Management Plan is to create change, supporting better, sustainable improvements for the existing user groups and the wildlife. The Horse Council and the Equestrian community at large respectfully requests that this process wait until the CSU experts visit, for a better informed Management Plan and RFP for a 10 year lease. CSU Equestrian Department’s team of three, specializing in facility management, horses management, and their veterinarian are willing to come to consult, but so far City Parks Department has not schedule their visit. This should be done before the Management Plan is approved, and the RFP Process begins. The CSU team is willing to come visit in March. The RFVHC is asking you to table this decision until then. Come to the meeting and support our equestrian community, and learn what is going on with the Management Plan for the City owned, Cozy Point Ranch. CRITICAL ISSUE NEEDS EQUESTRIAN COMMENTS. COZY POINT MANAGEMENT PLAN DOES NOT ADDRESS THE HORSE PART OF THE MANAGEMENT PLAN WITH EQUAL CONSIDERATION. PLEASE READ AND COMMENT. LINK BELOW. The RFVHC strongly recommends all interested parties and equestrians review and comment on the proposed Cozy Point Management Plan published by the City of Aspen Parks and Open Space Department. Do not delay! They are literally counting each response and putting it in a graph table demonstrating public interest in Cozy Point Ranch! Public interest is noted as horse, farmer, bike, dog, wildlife, etc. If you are responding as having equestrian (horse) interest please state that. You can review the current Cozy Point Management Plan on-line at www.aspencommunityvoice.com It is 225 pages long. The open house meetings for comment from the community are Thursday 10-13-16 4-6pm Cozy Point Ranch and Thursday 10-20-16 4:30-6:30pm at the Red Brick Center for Arts. If you need help negotiating this website and response system call Austin Weiss directly at the City Parks and Open Space Department or reach him on-line. To All Who Support Horses in the Roaring Fork Valley: WE ARE REQUESTING IMMEDIATE ACTION FROM “YOU”. The RFVHC wants to encourage everyone to respond to the Mayor and the City Council men and women. They need to confirm that we are actively involved by responding to the City of Aspen’s Cozy Point Ranch Draft Management Plan. The deadline for ALL responses is November 18, 2016. COZY POINT MANAGEMENT PLAN DOES NOT ADDRESS THE HORSE PART OF THE MANAGEMENT PLAN WITH EQUAL CONSIDERATION. To read the plan in entirety, go to: aspencommunityvoice.com. Click on Cozy Pont Draft Management Plan, then on the right side – under document library you will find the plan (225 pages) Please read and comment on these pages, where equestrian improvements are discussed Pages 5,6,8,10,11,12,15, 16,17,25,26,28,35,36,38,42,46,47,49,54,55 and then original Management Recommendations found on page 81-83. At the Cozy Point site visit on October 13th, 2016 an Aspen City Councilman recommended immediate action from horsemen and horsewomen. He emphasized several times that the City Council needs to hear directly from the equestrian community. He indicated that the horse community is losing badly in the numbers of respondents and notices to the City. Specifically, he recommended responding by sticky notes at these open houses, and for us to write responses on aspencommunityvoice.com. Please read all of the responses and give your “thumbs up” to comments offered if you agree and thumbs down, if you do not. Get in and stay involved. In the past the RFVHC submitted many letters to the City of Aspen OST voiced by people in favor of keeping Cozy Point a welcoming public horse facility. We will be resending that batch of letters. Now that the Management Plan has been published we need to respond to their plan. We equestrians are not being heard. Please express your thoughts and feelings about the three-phase, 20 year plan, of the city’s vision for improvements at Cozy Point. Explain your connection with horses, how they have affected your life, why Cozy Point Ranch deserves a redesign and renovation enhancement after 34 years, how education with horses at Cozy Point Ranch serves our community, and add any other positive ideas that come to mind. The farming and TREE supporters are currently doing their outreach very successfully. Let’s get cracking and flood the aspencommunityvoice.com web site with voices from horsemen & horsewomen. Please write new letters to the Aspen City Council. The Roaring Fork Valley Horse Council is working to create a concept for a beautiful, orderly, functional, and productive Cozy Point Ranch. We want to promote and enhance the historic use of the ranch as an equestrian center and riding school. The educational opportunities of the ranch including: agriculture such as TREE or ACES, riparian restoration, archery, and Western Heritage awareness, which corresponds beautifully with the educational opportunities offered by the equestrian facility. We would like to conserve our resources & pool our knowledge and collaborate with private, non-profit, City & County entities to come up with a well-planned, thoughtful, functional management plan for sustainable use of this property, which will benefit our community. See attached article in the Aspen Daily Times dated 1905, about the famous French imported percheron stallion, ”Boston”. 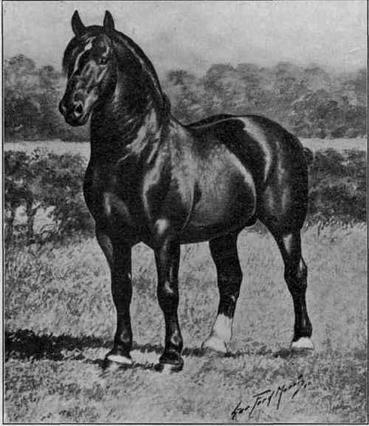 Obviously the Smiths spent their profit from the land for this famous breeding stallion, and were very committed to raising outstanding horses. The history of horses goes back to the beginning of ranching on this property. WHERE DID THE NAME COZY POINT COME FROM? Gladyce Hart Christiansen reported that the True Smith Ranch was noted for it’s big barn, and that the True Smith family lived here for many years. She noted that the railroad stop at Shale Bluffs was called Cozy Point, and that is how the ranch came to keep the name it has today. Legend has it, according to Ellamae Huffine Phillips, in the book “Aspen, The Quiet Years”, is quoted as saying that Cozy Point got it’s name from a railroad tunnel that was located a the base of shale bluffs. 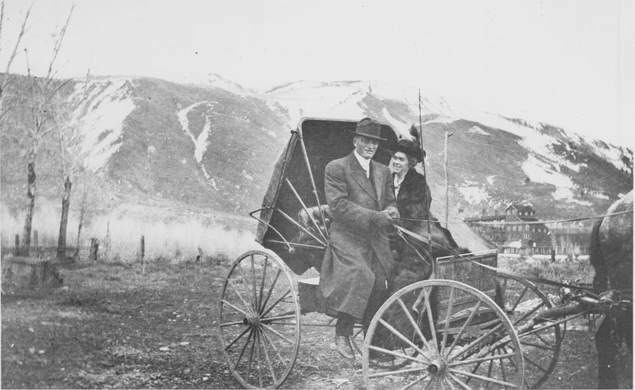 Photograph in 1913 of Lewis and Mary Vagneur in a carriage in Aspen, with Smuggler Mountain in the background. There is a mining structure that is also visible. Perhaps they were on their way to or from the favored sweetheart tunnel? HOW LONG HAVE HORSES BEEN HERE? This recorded statement is very specific. The RFVHC is hoping to work with the staff and other stakeholders for a collaborative Cozy Point Management Plan. We put forward this expectation in good faith and with a generous heart. We are asking membership to support Cozy Point for continue equestrian use. 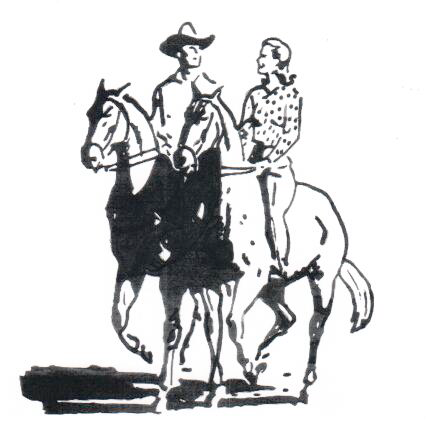 I have been a member of the board and a volunteer for the Roaring Fork Hounds Pony Club for many years. Our local Pony Club Chapter has been in existence for over 40 years and is an invaluable institution for the Valleys youth. Our local Pony Club is very interested preserving Cozy Point as a first class equestrian center, with links to all the existing and planned trail systems throughout the Valley. All of the members are excited to participate in creating the Cozy Point Master Plan. Our local club is a chapter of a Regional, National, and International nonprofit volunteer Organization started in Great Britain in 1928. By 1992 there were 125,000 members in twenty-seven countries, making it the largest junior equestrian group in the world. United States Pony Clubs develops character, leadership, confidence, and a sense of community in youth through a program that teaches the care of horses and ponies, riding, and mounted sports. Over sixty five % of Olympians were members of Pony Club in their youth. USPC History and core values. Article written by Equestrian Olympian Medalist Karen O’Connor from “Equine Land Conservation Resource”. The article describes partnerships between equestrian communities and local government entities. Other communities are creating Parks for equestrian use, recognizing rapidly disappearing lands. Our Valley is a perfect example of the need to set aside lands for public equestrian use. Photos of the Kentucky Horse Park - a national treasure and revered in the International community. “Developing the Sport Horse” This is an educational article describing how critical it is that all horses have access to large open spaces for their health and well being. The ability for horses and riders to move over large areas for exercise and mental well being, prevents injury, and leads to longer happier lives for both horses and their riders. Cozy Point has a finite number of acres. This is a now or never situation. Cozy Point is the only public equestrian facility in the Roaring Fork Valley. 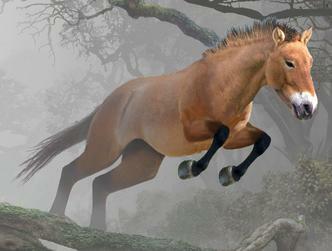 The time is now for the community to decide if they want to have a Horse Park. The City of Aspen is taking public comment now for Cozy Point Ranch. We need the community to weigh in on the Importance of keeping Cozy Point an Equestrian Center / Horse Ranch, with ample space for horse exercise, pasture turn out, trails, and please support the RFVHC mission for a new sustainable, clean, functional, and verdant facility for horses and the generations of equestrians to come.